In this chart posted by Huneke, the percentage of gay or LGBTQ support for various right-wing parties is shown in the second column. The right-most column shows whether gays and LGBTQ people supported these candidates more often than straight voters (green) or less often (red). In the 2018 U.S. midterm elections, 82% of LGBTQ voters voted for Democrats, America’s more pro-LGBTQ political party. 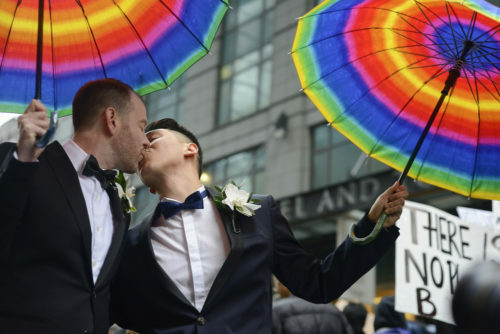 But in many other Western countries “right-wing and virulently homophobic parties enjoy considerable support among gay voters,” says Samuel Huneke, a gay historian at Stanford University who studies modern European culture. LGBT voters in other [non-U.S.] countries were less likely to support the conservative (or in some cases far-right) party by an average of only seven percent. And when you look only at gay men, the results are even more striking. In other countries, gay men were, on average, more likely than the general electorate to support the conservative or far-right party. For example, a 2015 French poll showed 26% of gay and bisexual male voters supporting Marine Le Pen, the anti-gay politician with the far-right National Front party — only 16% of straight voters supported Le Pen. That same year, 38% of gay male couples voted for Le Pen’s party whereas only 29% of straight couples did the same. Huneke notes that in France and Brazil’s run-off presidential elections, the far-right politicians in each of those two-person races each received a substantial fraction of the gay male vote. In the UK, 26% of LGBTQ voters supported the Conservative Party. In this chart posted by Huneke, the second column shows the percentage of gay or LGBTQ support for various right-wing parties. The right-most column shows whether gays and LGBTQ people supported these candidates more often (green) or less often (red) than straight voters. This isn’t a formal study and Huneke states that the polling around this issue is slim, so we can’t draw overarching conclusions. For example, in Germany, Huneke admits the picture is hazier: Only 2.7% of LGBTQ voters supported Germany’s far-right, homophobic party Alternative for Germany (AfD). But even still, Huneke thinks that when gay men are studied as an individual group, substantial numbers of them vote right-ward. He says this isn’t true in America where the GOP’s longstanding opposition to HIV-related healthcare, marriage equality and other LGBTQ civil rights have driven majorities of gay voters into the Democratic tent. But in other Western countries lacking the same two-party system of villains and heroes, the gay vote doesn’t always lean liberal. “Gay politics in other countries prove that LGBT people — especially gay men — are not inherently progressive voters. Give them the chance and they will vote for xenophobia, for racism, and for misogyny. Democrats (and progressive parties in other countries, for that matter) cannot and must not take the gay vote for granted,” Huneke concludes.